A dual NMR data acquisition strategy to handle and detect two active equivalent transfer pathways is presented and discussed. 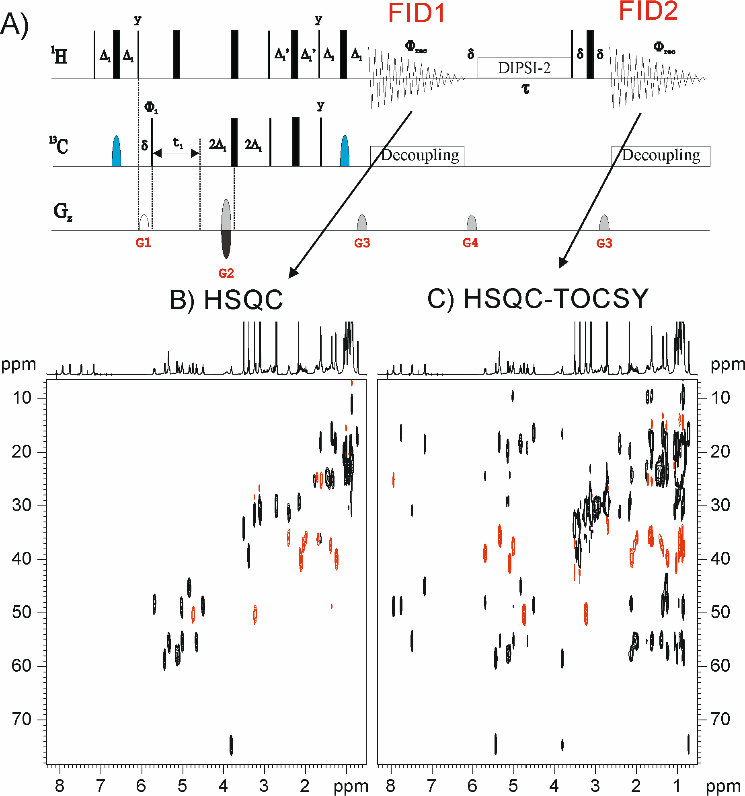 We illustrate the power of this time-efficient approach by collecting two different 2D spectra simultaneously in a single experiment: (i) TOCSY or HSQC-TOCSY spectra with different mixing times, (ii) F2-13C-coupled and decoupled HSQC spectra, (iii) conventional and pureshift HSQC spectra, and (iv) complementary HSQC and HSQC-TOCSY spectra. 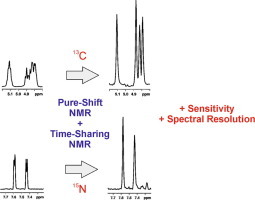 The concepts of pure-shift NMR and time-shared NMR are merged in a single NMR experiment. A 13C/15N time-shared version of the real-time BIRD-based broadband homodecoupled HSQC experiment is described. This time-efficient approach affords simultaneously 1H-13C and 1H-15N pure-shift HSQC spectra in a single acquisition, while achieving substantial gains in both sensitivity and spectral resolution. We also present a related 13C/15N-F2-coupled homodecoupled version of the CLIP-HSQC experiment for the simultaneous measurement of 1JCH and 1JNH from the simplified doublets observed along the direct dimension. Finally, a novel J-resolved HSQC experiment has been designed for the simple and automated determination of both 1JCH/1JNH from a 2D J-resolved spectrum. Multiple-FID acquisition (MFA) within the same scan is applied to acquire simultaneously multiple 2D spectra from a single NMR experiment. A discussion on the incorporation of the MFA strategy in several homonuclear and heteronuclear 2D pulse sequences is presented. 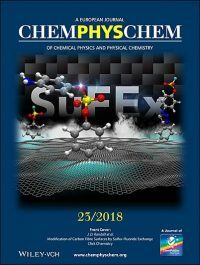 As a proof of concept, a set of novel COSY, TOCSY and HMBC experiments are reported as a time-efficient solution in small-molecule NMR spectroscopy.